Laminate, mount and encapsulate in one pass up to 1/2 inch thick. No set up change required providing simple operations. With a top speed of 30 FPM and a sustainable laminating speed of 10 FPM with 5-mil film, the Ledco Digitals are much faster than the other machines made for big format color applications. With the release liner take-up allows the Digital series to apply cold laminating films, vinyl's and other PSA materials needing removal of a liner. Standard features include variable speed, independent top and bottom heat control, spacious feed tray, powerful film cooling system. Hot Roll laminator is the newest edition to the Ledco family. Has all the same features of the 42" model but used heated rollers for laminating. Shipped fully assembled on the stand with a helpful operator's manual and a 90-minute instructional videotape. Ledco provides a toll-free help line to backup the training and support required of its dealers. Customers are encouraged to call so that small problems do not become big ones. 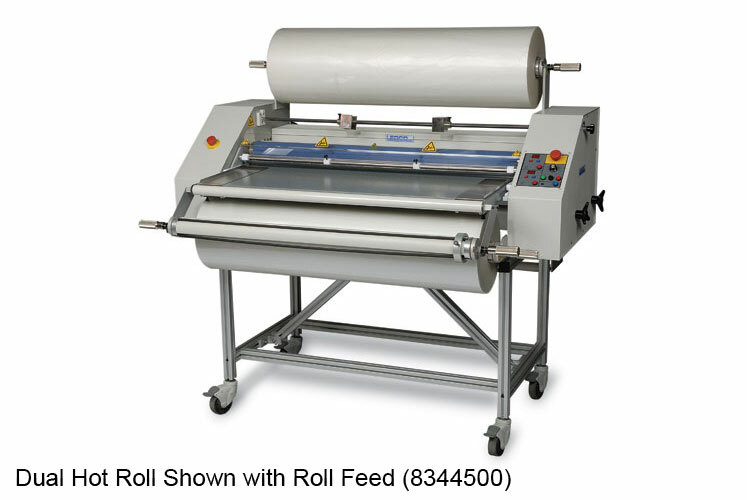 The Dual Hot Roll laminator comes with a Built-in Release liner Take-up. The features of this new laminator are the same outstanding features noted in Ledco's quality products. Price include heavy duty stand. Laminating Roller Diameter 3 1/8"
Max. Film Roll Diameter 12"
Weight / Shipping Weight 550 lba. / 850 lbs.